Congratulatory cheers, hugs and tears were on full display at the annual Match Day celebration, when the next generation of physicians opened envelopes that revealed their residency placements. Christina Camick was matched to her top choice, UT, in general surgery. Retaining top talent in the area continues to trend in a positive direction with 10 percent of the 156 fourth-year medical students graduating in May staying in northwest Ohio to continue their training. 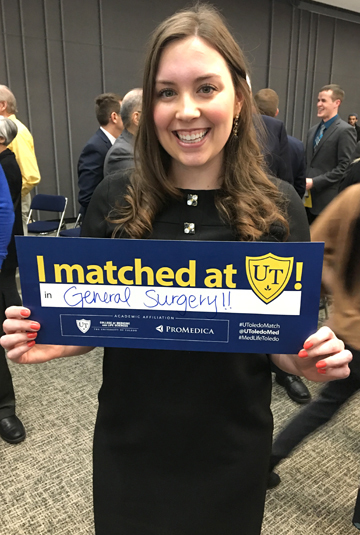 Christina Camick matched to UT for her residency in general surgery, her top choice. Grace Maltbie will go to Case Western/University Hospitals close to her parents where she will be a resident in the radiology department. 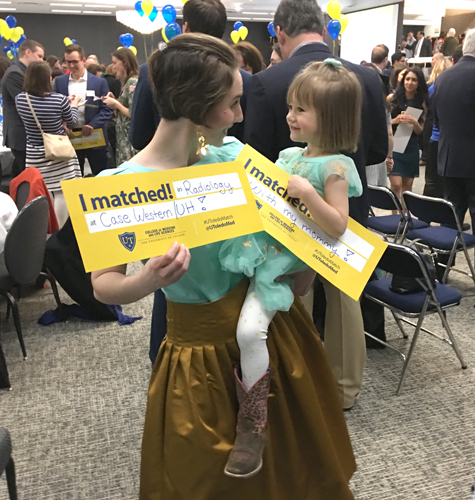 Grace Anne Maltbie and her 3-year old daughter, Anna Maria, celebrated her match to Case Western/University Hospitals. Mike Maltbie, Grace’s father, was particularly excited with his daughter’s placement. “I work at Case Western Reserve University doing information security, so I will be able to walk to a Starbucks and bring my daughter coffee after she’s had a long shift,” he said. In addition to getting matched to the University of Pittsburgh in obstetrics and gynecology, Latima Collins also personally “matched” to her significant other when she became engaged at Match Day. UT medical students matched to institutions across the country; these included Yale New Haven Hospital, Massachusetts General Hospital and Duke University Medical Center. 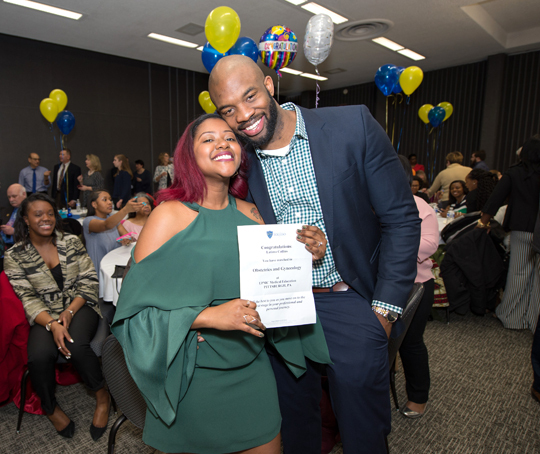 Latima Collins celebrated her match to the University of Pittsburgh and her engagement to Andrew Anamanya, who waited to pop the question at the ceremony. This year, students matched into 23 specialties, with 71, or 46 percent, in primary care fields, and 50, or 31 percent, entering other specialties. The top specialties for this graduating class were internal medicine, pediatrics, emergency medicine and anesthesiology. Ohio was the most popular state with 61 students matching here. The second most popular state was Michigan with 19, followed by Pennsylvania with12. Overall, students matched with programs in 29 states. This entry was posted on Friday, March 16th, 2018 at 4:02 pm and is filed under Events, Medicine and Life Sciences, News, UTMC, UToday .